Drone wedding photography is a kind of taking photos and videos by a remotely-operated aerial vehicle, also known as a drone. Photographers use drone for wedding photography to capture the aerial views and bird's eye view of a couple or ceremony. It will allow you to use completely new angles for taking event photos and realize the craziest ideas for a photo session. More and more couples order drone for wedding photography services and are ready to pay the additional cost for it. So, it means if you provide drone photography wedding services, the number of your customers will significantly grow. Let’s find out how to add wedding drone photography to your services’ list. Drone wedding photography is one of the most popular services nowadays. It is better to use the drones after the main photo session, as they give you a chance to get impressive shots from non-standard angles. Such photos can’t be taken if you hold the camera in hands or place it on a tripod. The first question the shooters try to answer when they start using drones is “What is the best drone for wedding photography?” You have to understand that this device isn’t cheap. The drone wedding videographer may cost approximately $300, but the wedding photography drone will cost about $700 if you really want to get great pictures. It may be trite, but the leaders in this industry are DJI, regarding the quality of the image and the drones. So, you’d better choose these models. This is probably the most popular drone in the world and it isn’t strange. It provides great quality and lots of extra features that will help make your shooting easier. The first reason why you should choose the Pro line is that it produces wonderful 24-megapixel photos in RAW format. Each photo is about 20MB, which means that the quality of the pictures is excellent, which is very important for the photo editing. It's not cheap, but for this price, you get a full set of the case for transportation, 8 extra screws, screw pads, two 16 and 32 GB memory cards, a control panel and of course the drone for wedding photography. It also has a built-in protection against accidental bumps, so you do not have to worry about it either. The tracking system is just awesome. You can just focus on the couple and the drone will follow them, which significantly simplifies the drone wedding photography. You will probably like this variant if you think that the Phantom is too large and bulky for the drone photography wedding. Besides, this wedding drone price is significantly lower, which attracts many shooters. It has a 12MP camera shooting in 4K. With the Pro version similar to Phantom you will get the RAW files for the image editing. The main advantage of Mavic is that it is more compact because it can be folded into a small rectangle. Thanks to its small size, you can fit it even in a small backpack. This drone for wedding photography has a slightly shorter flight time than the Phantom – 27 minutes instead of 35, but it's more than enough for everything you want to shoot. The kit consists of a control panel, 4 spare screws, two memory cards (16 and 32GB), protection for the camera and the drone itself. You will get all the additional features of the Phantom but in a smaller package. If this is your first drone photography experience, I recommend buying a simple and inexpensive drone (for less than $400) to practice flying and shooting. These drones will take not professional photos, because they have a built-in camera, a short time work (about 10 minutes) and do not have additional functions (return home or GPS pursuit modes). In terms of design Upair is like a DJI Phantom’s copy. BUT twice cheaper - a low price means some limitations. If you talk about the pros, it’s a 2K camera with a really great quality of shooting, and for an additional $50 you’ll get a 4K camera. There are many similar functions as DJI has, even a planned flight using GPS. The flight is 16 minutes. If we talk about the cons, the flight distance is no more than 300-400 meters, as well as the quality of assembly isn’t good too. The only model without the build-in camera, it can be replaced. Nevertheless, it has a good quality for its money - their H109S comes with a 1080p HD camera that supports real-time video transmission, remote control on Android with built-in screen. GPS, automatic return are included. The flight time is about 25 minutes. Flight range is 800-1000 meters. Speaking about its weak points, these are a breakable assembly and no information about battery charge. I recommend buying your first drone together with everything that you might need for the first try. Typically, these kits are not very expensive - $100 higher than a body drone, but you will not need to waste your time after buying a drone for buying memory cards, carrying bags, cleaning kit, propellers, etc. This is probably the best drone for wedding photography you can find among all the models available. Inside this drone there is a huge variety of different systems - barometers, motion sensors, two processors and even an additional built-in camera for a second shooter. The drone has a very high-quality assembly, so don’t worry about falling. A camera - 5.2K, 30 fps or 4K - 60 fps. You can change lenses from 18 to 90 mm. Unlike other drones, the Inspire 2 can move its camera. The visual tracking mode is as accurate as possible. This drone is used in filming and is 100% professional. Yuneec H520 is a universal drone, it is known as the best drone for commercial photography since it meets all standards. There are 6 screws, which means better maneuverability, as well as a choice of 3 cameras. It has the best system for preventing obstacles and scheduled flight by points. In the kit there is a remote control for the Android with its own screen. Whatever set of camera you would choose - it is a professional equipment. You can use the cheaper drones, or the earlier versions of the above mentioned models. But you won’t be able to get that wonderful image quality which made me choose these drones. It's important to remember that you need a smartphone to control these drones, so I recommend having a spare smartphone or the one, which is fully charged and needed just for the drone wedding photography. Moreover, you’d better have several power banks. If you have seriously decided to engage in the drone photography business, it is important to do everything legally, abiding all the laws. Moreover, you must always remember about the safety. The first thing to do is to register your drone at Federal Aviation Administration. What is the reason? 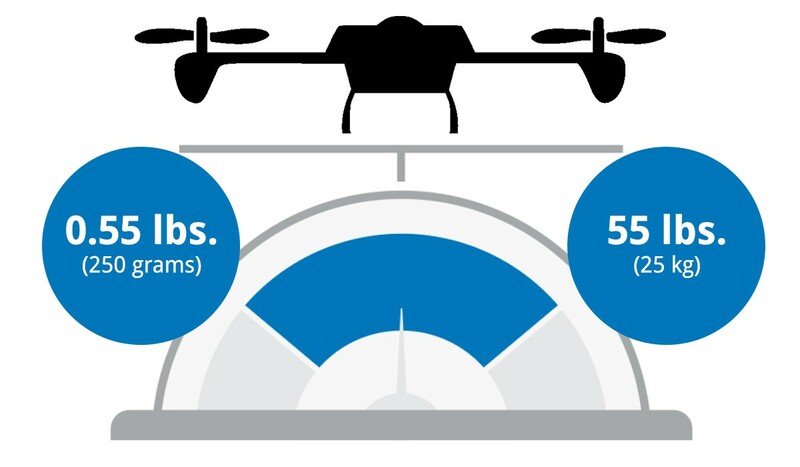 If you live in the US and want to shoot in the country using your drone, and your drone weighs more than 0.55 pounds (even a small Mavic weighs 1.6) then you need to have a special identification number for the device. The registration takes about 5 minutes and will cost only $5. Then you’ll get the number, which you need to write on your drone. The number will be identical for all the drones. You can write this on the bottom of the drone with a permanent marker. Be very careful! If you are caught using a drone without the number, you’ll be fined of $27,500. It costs more than a standard drone wedding photography price. Most experienced people will ask you to provide the insurance for the drone use, so it would be nice to have it issued before doing the drone wedding photography. Today it's easy to get the affordable insurance for the drone. The insurance companies started treating such issues seriously since the drones have become so popular. Drones have many breakable parts – screws, camera and even the case of the drone are very sensitive to damage. While the replacement of screws will cost you no more than $10, the purchase of a new camera, if you break it, will be almost half the price of the drone. Damage insurance can save you the cost of repair or the spares replacement if a drone falls. Besides, your customers will feel more confident about your professionalism and responsibility if you have the insurance for the drones. People realize that they need to pay extra money for the drone wedding photography and there are usually no problems because they will get really wonderful pictures in the end. But how a photographer can set the drone wedding photography cost? The first thing you need to take into account is the experience of using the drones. The customers want to know that you are not a simple amateur. The best choice is to visit the courses where you’ll learn how to control a drone. The duration of these courses is usually not more than a month, but you will get the invaluable experience under the supervision of real experts. The certificates of passing these courses will be an excellent proof of your experience, and, accordingly, will affect your drone photography cost. The second factor is the quality of your drone. No one will pay a photographer, who takes pictures with a drone that costs $200. Even the most experienced photographer cannot take high-quality pictures controlling a cheap and low-quality drone. So remember that a good drone means high drone wedding photography price. Third – additional services. If you provide drone videography and subsequent photo editing, you may charge more for the work. I suggest using drones to maximum and take not only the photos but also film celebrations to create an excellent video clip. In 2018 the average price for the drone wedding photography is about $600-900 depending on the additional services. When you think about the wedding photoshoot ideas for the first time, you will probably have to check dozens of videos and photo sessions, read wedding photography tips which may give you new ideas or you’ll just want to repeat those ones. In any case, you will have to spend lots of time to prepare a really beautiful photo session for your clients. For you to save your time and energy, we have picked up 10 interesting drone photography ideas. One of the most popular types of drone wedding photography is an amazing photo session against the natural background. The style is the following – the focus is on the couple, and the particular attention is paid to the fascinating views. If you want to recreate this idea, try to raise the drone as high as possible, but remember to keep the newlyweds clearly visible in the frame. You can also try to take the pictures of them lying in the water or on the shore, if they do not mind, of course. Immediately after the ceremony, it will be an excellent idea for drone wedding photography to gather all the guests near the church. It will also be very interesting to take a photo while leaving from the church when the guests will strew the newlyweds with petals. However, you should be careful and move away from people so as not to interfere with the noise from a drone. It is better to zoom in the image rather than to scare people. Also, try to take the pictures vertically over the heads of people. Another wedding drone photography idea is shooting the couple in the water. It looks great BUT be careful while shooting and mind its flight time. Probably one of the most popular drone photography wedding ideas. You can’t take this kind of photo without a drone, it will be difficult and you need a place and additional equipment. What is the drone wedding photography without the group photos? It has already become the classics. However, there is a significant difference between the photos taken with the usual camera and the drone. The last one will give you an opportunity to capture absolutely all the guests, and even the back rows, so you can forget about the problem when only the first two rows are visible in the photo. The evening wedding shots always have a special atmosphere, and they’ better be taken with the help of the wedding photography drone. As for the time, you should choose it according to the camera of your drone. It is better not to postpone it until late at night. The excellent time is half an hour after the sunset when the light is not so direct, but it is still not too dark outside. Professional wedding photo retouching, color correction and artistic photo manipulations from $5 per photo. This drone photography wedding idea is just wonderful and absolutely any customer will like it. All you need is a beautiful nature background and rocks. The meaning of this photo is to convey the beauty of the nature background. The newlyweds should be visible only as silhouettes, but not merge with the surrounding colors. The white bride's dress will not let you do it. What a bride would miss a personal photo session? Moreover, if you can use the most interesting angles, no one will ever refuse you! It looks very beautiful when the bride in a snow-white dress is photographed against the contrasting color backgrounds, for example on the dark green grass or in the forest. Thus, she is very highlighted in the picture. This kind of wedding photo on the grass looks particularly great. I recommend knowing a few places that perfectly fit this type of photography, preferably it's a golf course. Here are 10 basic drone photography tips that will help you not to screw the drone wedding photography up for the first time. Beautiful aerial wedding photos in your portfolio is a must for a beginning drone photographer. Who will order your services without drone wedding photographs? This rarely happens, but it will be useful to check whether there is permission to shoot on the ceremony venue. This is necessary only in some places, but it will take time to get the license, so you should take care of it in advance. There are even some cities that do not allow you to fly the drone over the private territory. You can find the list of prohibited places for shooting on official websites. If you have little experience in controlling the drone, you should not experiment right during the photo shooting, because in the worst case you can ruin not only the photo session, but also the ceremony itself, hurting the newlyweds or damaging their outfit. If you want to take photos both with the camera and the drone, then I recommend you to choose the time when you won’t try to be everywhere at once. It's better to shoot with the drone before or after the pre-wedding photo session. In such a way, you’ll be able to realize all your ideas without worrying about losing a good shot at the ceremony. There is no sense to shoot with the drone holding it in your hands. There are a lot of people who use a drone in order to take usual portrait photos, and it’s ridiculous because it takes much more time to take such shots. Besides, it can be dangerous as well, as if you lose control the drone can hurt the faces of the newlyweds. Drone is not a camera, which allows you to move silently in a crowd. If you've never heard the noise of a drone, just believe me, that no one can feel relaxed and behave naturally when there is noise as from a vacuum cleaner near you. Therefore, avoid shooting important moments with the drone for wedding photography, unless the newlyweds ask you about it. You should not start working without preparation. First, examine the location to detect the dangerous areas for the drone, such as trees, power lines, buildings, and so on. You will be completely concentrated on the picture during the shooting and will forget about the safety, so be sure there is nothing that can distract you. The secret of a good photo shoot is that you have to keep the movement smooth. Even if you have the best drone for wedding photography with an excellent camera focus control, you should remember that it is constantly vibrating, and if you make quick movements while the shutter is closed, the results can be awful. In any case, you can’t control the nature, so if it rains outside, then, unfortunately, it's a verdict for your drone photography. The moisture will simply “kill” the drone. You can take pictures indoors as well, but it won’t be that level. So don’t forget to mention this point in your wedding photography contract. It's quite difficult to catch a windless day, and if it's about shooting near the sea or the ocean, then it's absolutely impossible. If a small breeze is good for flights, then the stronger wind can carry your drone away. Of course, the heavier the drone is, the more unlikely it will b carried away, but I do not recommend you taking risks. You should avoid shooting indoors a lot, unless it is dine in the really large and high rooms. You will spend a lot of time taking pictures inside, as you need to take into account all the walls and concentrate half of your attention on avoiding inappropriate angles. Get prepared that such photos will take much more time than shooting outside. The main thing for you to remember is to stay invisible. Shooting with the camera, it is very difficult to get into the frame, but many photographers forget about it while taking photos with the drone and are captured in the shot standing with the remote control in their hands. Follow all these tips, and you will definitely achieve success. Even if the photography still remains one of the most popular wedding photography services, you should not forget about the drone videography. Hardly any couple would refuse a high-quality video about their Big Day. Do not forget that you are a photographer, but having a drone, you can provide additional video services as well. Impartially, the video that is recorded with the same camera can look boring, as it lacks variety of unusual shooting angles and positions. Watch the movies to see how it’s done – something is shot from a bird's eye view and sometimes the camera just hangs over the people. Previously, you needed the expensive equipment for this, now drones are used for such purposes, so why not try it? In fact, it's not so difficult to make a really high-quality drone wedding video, but you should remember the basic rules of good filming. Similar to the drone photography, the sharp frames spoil the picture, but if everything freezes in the photo, then the video should remain smooth throughout the entire recording process. All this pulling, braking, and sudden turns look very amateurish. You should see how it is done in the cinema - the camera is held in one position, and the drone flies more often straight, down or at a slight angle. Think the entire recording over, the direction of the flight and various angles in advance, and then you will not freeze with the remote control in your hands while working. One of the most annoying things I've seen in the drone camera wedding video are screws or pieces of the camera protection that get into the frame. This happens because the camera is directed too high towards the drone and the screws blur the picture in the upper corners because of their rapid movements. But the most irritating thing is the black spot on the left side. It is the protection of the drone and many people forget to place it in such a way that it won’t be seen in the process of work. DJI drones and many other models support the gesture management, and not many photographers use it in the drone wedding videography. After using the gestures, drones can both fly away from you to a certain height or follow the person. Watch some videos to see how it works. Such videos are very popular, and allow the newlyweds to participate in the creation of their own wedding clip. If you still think that somehow you will be able to shoot a conversation, live music or anything else, just forget about it! Even with the best microphone, you cannot eliminate the noise that your drone creates. Noise-reducing tools and software can not cope with this, as well as external microphones, so if you want a video with sound, record it separately without a drone and then add to the video, although it is better not to do it. Many drones, even not the most expensive ones, support the mode of flight along the predetermined trajectory in the form of the imaginary line. This will help you perform an excellent and smooth recording. You can make the drone fly around the couple. It's also a great way to control a drone if you do not have access to GPS navigation in the place you plan to work. After buying a drone, getting a flight permit, and insurance, I really recommend visiting several courses that will help you make an excellent start. Of course, for the first time, the free lessons on YouTube will be enough for you, but this is all about theory. Everything is much harder in practice. Drone Pilot Training is one of the best schools that specializes on the drone pilotage. You will get a chance to attend the personal classes with instructors who will show and tell you about the basic mistakes the newcomers make, and also teach you a couple of tricks. It's not quite cheap, but it will help you avoid the most frequent mistakes and quickly increase your level of drone proficiency. Online Aerial Photography Course. These are really necessary courses that will provide you with the essential knowledge from the photographers who shoot with the drone. Here they will tell how to choose the right angle, how to make your photos as clear as possible, what camera settings to use, and much more useful things about the drone shooting. Starting a Drone Business Under Part. If you want to do everything right and open the legal drone shooting business, then it's better to address the professionals who will explain all the nuances, what you can and cannot do, as well as where you can shoot. They will also register your drone and give some advice on drone photography business management. Now you know everything you need to start your drone wedding photography business and be sure that all your photo sessions will be successful.